Nnamdi Kanu who has turned out to be a global phenomenon was ambushed and abducted in his hotel room in Lagos, Nigeria, by the Nigeria Department of state services(DSS) on the 14th of October 2015. Many have come out to publicly criticize the arrest of Nnamdi Kanu by labeling it as a dumb move from President Muhammadu Buhari. It was analyzed by some that Mr Buhari played right into the trap of the leader of the Indigenous people of Biafra, thereby drawing the attention of WorldPress and the world at large towards asking the question who is Nnamdi Kanu? And further more, it once again brought up the issue of Biafra that was thought to be buried and forgotten. Now after so much pressure from some world leaders and the Press on president Muhammadu Buhari to release Nnamdi Kanu, the story now seems to be taking a new turn. President Muhammadu Buhari seems to have run out of options on what to do with Nnamdi Kanu and the issue of Biafra. In fact even bribing Judges to frustrate the judicial process doesn't seem to be working anymore. Even though, Buhari vowed to never release Nnamdi Kanu, he may have to sit and rethink on that because at this pace, his corrupt Judges, biased Security agents and dictatorial government might get to a point of oblivion. Judges ought to be public servants and they are put in place to administrate our laws. But all too often judges make decisions that are contrary to the law or against the weight of evidence, just like what president Muhammadu Buhari is doing to every Judge handling Nnamdi Kanu's court case. While money can be the motivation for judicial corruption, we find that judges are most often corrupted by their own ideology and personal affiliations. Don't forget, Judges are appointed by politicians, not elected. In fact, Judges are often failed politicians that were never able to convince their communities to make laws consistent with their own agendas. So these frustrated law makers take jobs as judges and make rulings on cases to fit their own world view, while ignoring the evidence and the law. At this point, Nnamdi Kanu's court case is turning out to be a curse on any Judge handling his trial. Most Judges don't want to have anything to do with the case of Nnamdi Kanu, talk more been forced into a position where they would have to go against their oath to bend the law just to please President Buhari. Judge's who tried to manipulate Nnamdi Kanu's trials by going against the Judicial process have gotten what I call "THE NK'S CURSE". Justice Tsoho is an example of "THE NK'S CURSE". After so much contradictions and corrupt rulings while in charge of Nnamdi Kanu's court case, Judge Tsoho finally stepped down but that was after he was hit with the Curse. As a result of the Curse, Justice Tsoho lost his honour, prestige, reputation and career. Also recall, the first judge, Ahmed Mohammed also stepped down in December 2015, after failing to handle Nnamdi Kanu's court case properly, he escaped the Curse very narrowly because he decided to backout on time but the enigma is still following him. Justice Ademola has so far been the only judge to be slightly remembered as a fair judge who have handled Nnamdi Kanu's court case and that was courtesy of the bail he granted Nnamdi Kanu but I can't say he enjoyed a blessing or suffered a curse from the case because he was just caught in-between the both. Justice Ademola wasn't bold enough to stand up against president Muhammadu Buhari's Judicial conspiracy when he was handling Nnamdi Kanu's case, if not he would have enjoyed "THE NK'S BLESSING". When handed wrongly, Nnamdi Kanu's case would be a curse to Judges. Note- "THE NK'S CURSE" can only work on corrupt Judges and also on Judges who decides to sell their oaths to president Muhammadu Buhari's undemocratical adminstration. Unfortunately, no Judge that has handled the leader of the Indigenous people of Biafra court case has enjoyed the benefits of "THE NK'S BLESSING" at least not yet. Only Judges who remains unchanged, unshakable and incorruptible while handling Nnamdi Kanu's court case can enjoy this BLESSING. Besides it shouldn't be hard to get a Judge who is willing to do the right thing and perform their own duties to uphold the law, afterall they did swear an oath to do so. Justice Binta Nyako on the other hand can make a difference or choose to follow in the footsteps of, Justice Tsoho. We saw where that got him. As far as am concerned, i haven't come to a verdict on Justice Binta Nyako because it's still pending. But the power to destroy and make her career is in her hands. She can decide if she wants to be a puppet for President Muhammadu Buhari or stand up to him and let Justice take its course, either Way's we the Indigenous people of Biafra would always prevail. So what are the Five reasons why Nnamdi Kanu's court case would be a curse or a blessing to Judges. I believe in karma and all the bad things that you do will come back and haunt you. Truth will always prevail no matter how hard or long one tries to cover it up. We all know that Nnamdi Kanu's case is all falsified and that president Buhari is only conspiring to jail him without any truth and evidence just because he asked for self-determination for his people(Biafrans). So Nnamdi Kanu's court case would definitely be a curse to any Judge that tries to cover the truth up and a Blessing to any Judge that tries to reveal it. Nnamdi Kanu's case has drawn the attention of the whole world. 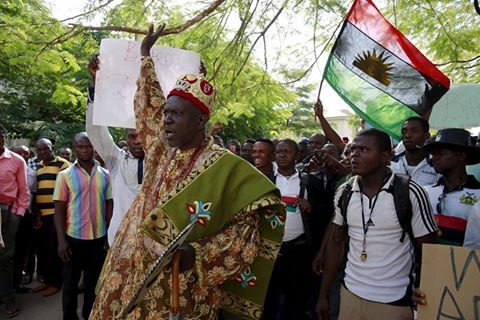 Some World leaders have now shown interest, while some have already called for the unconditional release of the leader of the Indigenous people of Biafra. Even international communities like Amnesty International has already condemned the dictatorial government of Muhammadu Buhari. Looking at the way things have turned out now, any Judge handling Nnamdi Kanu's case must be extremely careful not to destroy their own image and career by having the assumption that president Muhammadu Buhari would cover up their incompetency should they decide to tangle along with bribery and corruption, just like Justice Tsoho did. So either Way's this would be a curse or a blessing to Judges because whether they do, they must do carefully and by the law because they have the attention of the world. Anyone that says Nnamdi Kanu is guilty and should be prosecuted must be under Buhari's enchantment. It's as simple as that. It's no news that Nnamdi Kanu's arrest is as a result of Tryanny in an Autocracy adminstration. Nnamdi Kanu is prisoner of conscience, we all know that and it's no wonder every Judge seem to have crumbled horribly while handling his case. How can you arrest and prosecute a man who is clearly innocent and has the backing/Prayers of his people, and you expect to not get hammered along the way. As long as any Judge handling Nnamdi Kanu's court case decides to dine with President Buhari to sentence an innocent man indefinitely, that Judge would forever be cursed and not just CURSED but destroyed too. When judges are sworn in, they take oaths. Oaths that says they would uphold the law and also allow justice to prevail without fear or favour, affection or ill will. Once you’ve taken the Oath or given an Affirmation in Court you are legally obliged to be completely honest. If you’re caught out lying you can be charged with perjury, contempt of Court or even perverting the course of justice. Lying under oath can be both a criminal and a civil offence. Alot of Judges take their oaths for granted right after they vow to not break them. Many Judges don't believe that there are consequences attached to taking oaths, so they just joke about it. Well, any Judge having the same mindset while handling Nnamdi Kanu's case, is in for a long miserable ride. Breaking an oath can result in judgment and the destruction of the work of our hands. So its my advice that, any Judge appointed to take charge of Nnamdi Kanu's case remember their oath of office. Breaking that alone has its own repercussions, let alone getting slammed by "THE NK'S CURSE". President Muhammadu Buhari assumed Office as a democratic president on 29th of May, 2015. Seven(7) months later he had Nnamdi Kanu arrested. Since president Buhari assumed Office, close to 3000 innocent unarmed Biafrans have been killed by his Armed Forces in less than two years in office. I recall in Anambra state(Biafra land), when Nnamdi Kanu was allegedly granted bail by Justice Ademola, some Biafrans gathered peacefully in their large numbers celebrating, when suddenly the Nigeria Armed Forces opened on them killing over 70(Seventy) and injuring over 100(Hundred). What's my point of all this? Judges handling Nnamdi Kanu's case should realize that each time they decide to side with President Buhari to oppress and frustrate the law, they are washing their hands in a bowl filled with the blood of innocent Biafrans, thereby activating "THE NK'S CURSE". So who ever the Judge may be, he/she must remember that they can partake in "THE NK'S BLESSING" if they do what's right and uphold the oath they took. Very wonderful analysis. SO thoughtful of you.